The Spooners have left. Sniff. I know,, I know... you're all sad... we're feeling it too. They were a very special pair, lovely inside and out, and I know even though their visit was brief, they captured your hearts. Mama Roxanne reports the kittens are doing really well and she and Ian already are completely smitten with these two. No surprise there! How could they not be? You'll be happy to know there will be lots of pictures. Roxanne is a photographer, and is enjoying her new subject matter immensely. She's already shared a few with me, and they're lovely. Here's my favorite of dear little Theodore. I went to the HS yesterday to drop of the adoption paperwork and to see if there were any kittens in the foster room. There wasn't a single kitten to be found. I don't imagine there will be too long of a wait, kitten season should be starting soon. We've already seen a couple of pregnant mama cats at the shelter. While we wait, I've got a couple of more alumni updates, another Spooner movie, more Spooner pics, and Ms. Drewey may just make an appearance too. As Ann said...there is just something about that old gal, Drewey. Whoever it is I'm sure they've grown into a lovely grownup kitty. Orson! 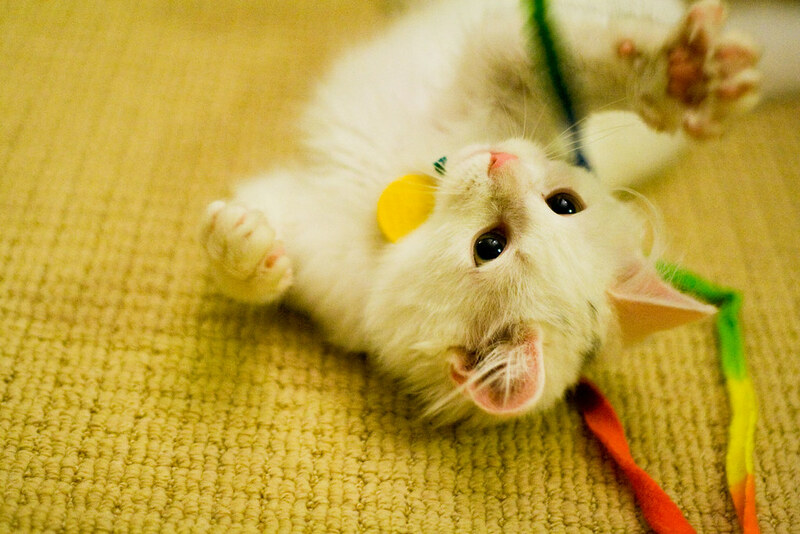 He was such an adorable kitten and totally captured my heart. Looking forward to the alumni updates and more Drewey pics! Sigh. Got to admit those Spooners really touched my heart. I am looking forward to Roxanne's documenting their growing up. Dare we hope for a blog? Anxiously awaiting the alumni photos...and DREWEY!!! Looks like they're right at home with their new family. Have fun in your new home dear little Spooners. It looks like you are already having a great time which makes me happy. Going through ear floof withdrawal. Please send help now. Must see floof soon. Hooray the Spooners went home! Hooray there are no kittens who need fostering! :Sniff: We will miss them, but it is a happy ending. Awwwww I love this picture of Mr. Theodore! His little nose and paws and ears are so pink - my very favorite color (which also happens to be the color of the shirt I'm wearing today!). He is just adorable. I'm so glad they are off to their forever home. I'm sure all 4 of them will be blissfully happy for years to come. None of that changes the fact that I NEED those kittens for my own. I'll just live vicariously through knowing they are loved and well taken care off.